AUTHOR INFORMATION: Ari Marmell is a graduate of the University of Houston with a Creative Writing degree, and has written several shared-world short stories and novels including Agents of Artifice (Magic: the Gathering). He is also the author of The Conqueror’s Shadow and the forthcoming novels from Pyr, The Goblin Corps and Household Gods. PLOT SUMMARY: Corvis Rebaine, the Terror of the East, is no hero. In his trademark suit of black armor and skull-like helm, armed with a demon-forged axe, in command of a demonic slave, and with allies that include a bloodthirsty ogre, Rebaine has twice brought death and destruction to Imphallion in pursuit of a better, more equitable and just society. If he had to kill countless innocents in order to achieve that dream, so be it. At least that was the old Rebaine. Before he slew the mad warlord Audriss. Before he banished the demon Khanda. Before he lost his wife and children, who could not forgive or forget his violent crimes. Now, years later, Rebaine lives in a distant city, under a false name, a member of one of the Guilds he despises, trying to achieve change nonviolently, from within the power structure. Not even when the neighboring nation of Cephira invades Imphallion and the bickering Guilds prove unable to respond does Rebaine return to his old habits of slaughter. But someone else does. Someone wearing Rebaine’s black armor and bearing what appears to be his axe. Someone who is, if anything, even less careful of human life than Rebaine was. Now Baron Jassion, Rebaine’s old nemesis, is hunting him once more, aided by a mysterious sorcerer named Kaleb, whose powers and secrets make him a more dangerous enemy than Rebaine has ever known. Even worse, accompanying them is a young woman who hates Corvis Rebaine perhaps more than anyone else: his own daughter, Mellorin. Suddenly Rebaine seems to have no choice. To clear his name, to protect his country, and to reconcile with his family, must he once again become the Terror of the East? FORMAT/INFO: The Warlord’s Legacy is 384 pages long divided over twenty-three numbered chapters and an Epilogue. Narration is in the third-person via several different point-of-views, including Corvis Rebaine, Kaleb, Baron Jassion of Braetlyn, Salia Mavere of the Blacksmiths’ Guild, Baroness Irrial of Rahariem, Mellorin, Seilloah, Ellowaine, etc. The Warlord’s Legacy takes place six years after the end of The Conqueror’s Shadow, but can be read on its own, although I would recommend finishing The Conqueror’s Shadow first in order to get the most out of The Warlord’s Legacy. January 25, 2011 marks the North American Hardcover publication of The Warlord’s Legacy via Bantam Spectra. Cover art is once again provided by Larry Rostant. The UK version (see below) will be published on March 10, 2011 via Gollancz. There are many reasons why I enjoyed The Conqueror’s Shadow including the humor and the characters and the sword & sorcery action, but above all else, The Conqueror’s Shadow was just a blast to read. 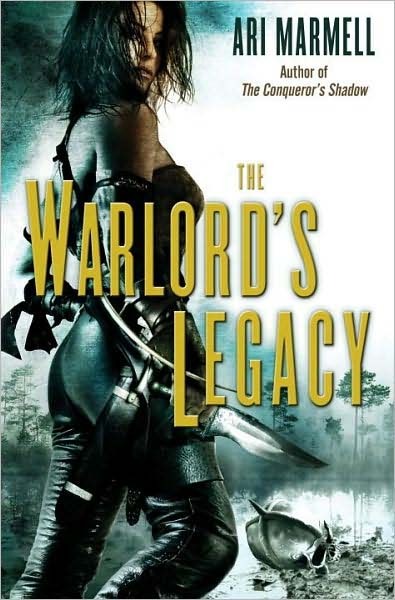 The Warlord’s Legacy uses basically the same formula as its predecessor, but the overall tone of the book tries to be more serious than it was in The Conqueror’s Shadow. The problem with this is twofold. For starters, the humor—which was such an important part of The Conqueror’s Shadow—has been significantly toned down in The Warlord’s Legacy. Sure, there are still jokes and sarcasm present in the novel, but I really found myself missing the playfulness of The Conqueror’s Shadow, especially the banter between Corvis Rebaine and the demon Khanda. Of course, considering the more serious tone of The Warlord’s Legacy, the book might have worked better if the author had just done away with any humor altogether. The bigger issue though is with the characters. To be blunt, characterization—specifically indepth characterization—is not one of Ari Marmell’s strong points, which is a major problem considering the novel pretty much hinges on the difficult moral dilemmas (murdering the lives of thousands for the sake of millions, forsaking his friends and family in order to protect them, etc.) that Corvis Rebaine is constantly dealing with, and the driving motivations behind the people whose lives he has ruined including Jassion, Baroness Irrial, and his very own daughter, Mellorin. Basically, the author provides just enough characterization for readers to understand why Rebaine did what he did, or why Jassion wants revenge, or why Mellorin seeks answers from her father, but not enough to actually care. It’s a real shame too considering all of the tragic drama that never lives up to its full potential from the lives sacrificed by major characters to the transformation of people whose innocence is lost. Unfortunately, there are other issues with The Warlord’s Legacy starting with a weak plot that rehashes material from The Conqueror’s Shadow, and just seemed more like an excuse to get Rebaine and former allies and enemies together again than an attempt at an actual story. World-building meanwhile, is once again non-existent, while the magic (demon-forged weapons, teleportation, mind control, etc.) in the book, though entertaining, is uninventive. Even the interludes—one of the things I loved most about The Conqueror’s Shadow—were disappointing. Instead of providing additional insight or depth to the characters like they did in The Conqueror’s Shadow, the brief flashbacks in The Warlord’s Legacy offered no real value to the novel apart from the occasional plot revelation or advancement. On the positive side, Ari Marmell is a talented writer with a lot of potential. 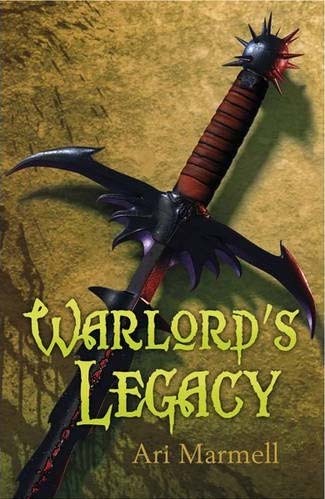 True, his characterization needs work as does his world-building, and I still can’t believe how feeble the plot was in The Warlord’s Legacy, but in the two books that I’ve read by the author, he’s demonstrated skillful pacing, vivid action sequences, and an ability to entertain the reader. And on top of all that, he’s also shown improvement as a writer, as evidenced by some impressive prose in the sequel. Plus, even though The Warlord’s Legacy was a disappointment, I really liked the way he ended the novel, leaving open the possibility for another sequel featuring a different character.